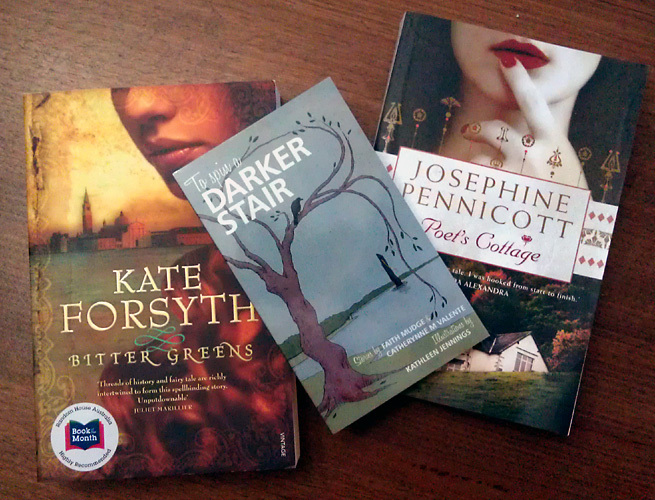 That’s Bitter Greens by Kate Forsyth AND Poet’s Cottage by Josephine Pennicott AND To Spin a Darker Stair edited by Tehani Wessley which contains stories by Catherynne M Valente and Faith Mudge, as well as beautiful illustrations by Kathleen Jennings. I am soooooo tempted to take myself off to a hotel room this weekend and do nothing but read and order room service. Forget funding grants and so on for writers … I want a Reading Residency, dammit! Well I think you will appreciate Bitter Greens. I really enjoyed it and it was much darker in places than I suspected.